LOS ANGELES – Sept. 14, 2016 – PRLog — Charles E. Blake, Presiding Bishop of the Church of God in Christ (COGIC), and pastor of West Angeles Church of God in Christ was voted to the prestigious Executive Council of the Pentecostal World Fellowship. The Pentecostal World Fellowship is a cooperative body of Pentecostal churches and groups around the world. Blake’s appointment came during the September 7th through September 10th, 24th Pentecostal World Conference in Sal Paulo, Brazil. Tens of thousands from Pentecostal Churches from around the world converged on Sal Paulo to commemorate the “60 Years of Celebration of the Pentecostal Family”. Bishop Blake was also a keynote speaker at the conference. 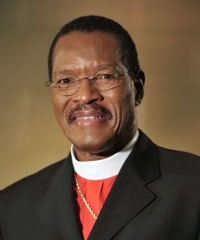 Bishop Blake is the Presiding Bishop of COGIC which boasts of over 7 million members and is considered the leading and largest African-American denomination in the world. Blake is also Co-Chairperson to the leadership council of the Pentecostal/Charismatic Churches of North America. “I count it an honor and a blessing to serve on the Executive Committee of Pentecostal World Fellowship. God has grown the organization over the past 60 years, and I look forward to assist in the upcoming initiatives of the Pentecostal World Fellowship,” said Blake. Also voted onto the Executive Council at the conference was Dr. Young Hoon Lee, Pastor of the largest church in the world.